Respooling charge for orders less than 1000 continuous feet. KK, JJ Double ANSI/ASTM symbol for special tolerance wire. Consult factory for availability. 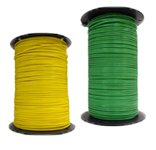 Length tandard packages are 1000 ft. spools. Shipping variance is plus or minus 10% of total amount ordered.